To make the most of your NDIS plan you need to be prepared for your planning meeting. Your planning meeting is the discussion you will have with a planner to help determine what goes in your NDIS plan. This means you need to understand what you get now and think about any areas of additional support you may need. Think about not only what you do, but where you do it, who supports you with the activity and to get ready for it. What support do you need to do these things? Write down how you get to activities, what support you might need for the activity, or for specific tasks such as personal care or meal assistance during the activity. This should be any support, including paid support, family support, aids and equipment or mainstream support (ie. doctor). You need to know what supports you get now to share this with your planner. Goals describe what you want to achieve. Once you are clear about what support you receive now and what works for you, this will help you think about your goals. During your planning meeting, the planner will talk to you about the goals you want to achieve across many aspects of your life. The planner asks this because a NDIS plan is based on goals, and supports will only be funded if they will help you meet these goals. Who will develop my NDIS plan? You will work with someone allocated by the NDIA to develop your plan. This might be a NDIS planner or a Local Area Coordinator (LAC). A LAC is from a NDIS partner organisation. All of these roles can be referred to as your planner. Your planner will not know you or your circumstances, so it is important to think now about what’s important for your plan, to assist with the planning process. Preparation is very important to help you make the most of your planning meeting. Yooralla’s free guide to prepare for the NDIS can help you prepare you for the discussion with your planner. When should I start preparing for my planning meeting? You should begin to prepare before the NDIS comes to your area. It is important to be prepared for your planning session because you are the expert about your disability and the support that you need. The NDIS is being progressively rolled out across Australia until 2019. Find out when the NDIS is coming to your area. how all of these things will be reflected in your plan. What will happen at my NDIS planning meeting? Your planner will organise a time to meet with you to discuss what should go in your NDIS plan. This may be face-to-face, at a NDIS or LAC office, or over the phone – whatever is most convenient for you. The planner will want to know about your life so they can develop a NDIS plan that meets your needs and helps you to achieve your goals. This means you need to describe your life in terms of your family, friends and what you like to do. More information on the NDIS planning process and how you can prepare for your planning meeting is available in Yooralla’s free guide to prepare for the NDIS. What will I be asked at my planning meeting? The planner will want to know about your life so they can develop a NDIS plan that meets your needs. This means you need to describe your life, including your family, friends and what you like to do. The planner will ask you about the supports you need to live the life you choose, how you manage everyday activities, and any part of your life where you require more support. They will also discuss your goals with you. At your planning meeting you will be asked how you would like your plan to be managed. This means how you want your service providers and supports to be paid. If your planner determines that you need Support Coordination to implement your NDIS plan, they will ask you in the planning meeting which service provider you would like to do this. Find out more about Support Coordination at Yooralla. What should I take to my planning meeting? When you go to your NDIS planning meeting, it is important to take documentation about your life, your current supports and your goals, to support the discussion with your planner and to make the most of your planning meeting. It’s a good idea to take any documentation relevant to your disability from doctors, therapists, educational institutions or from your current service providers. Yooralla has produced a checklist to guide you in gathering documents you might want to take to your planning meeting, and an activity planner to help you to write down all the things you want included in your NDIS plan. 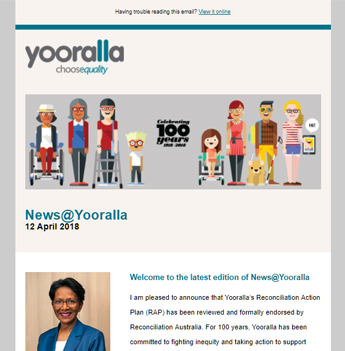 Download Yooralla’s free guide to prepare for the NDIS, complete the planners, and take it along to your planning meeting. You can also have another person to support you in your planning meeting. You can have family, friends, your current service provider or an advocate join you. Yooralla is holding free, one-on-one NDIS pre-planning discussions, to help people with disability and their carers to prepare for their NDIS planning meeting. If you already have the NDIS and you need support to prepare for your second or subsequent NDIS Plan, Yooralla’s free guide to making the most of your next NDIS plan can help you understand the process for your next NDIS plan and how you can prepare for your plan review meeting. It includes a meeting planning tool.